The same year he donned mutant wings, Foster had his break-out role as a high-strung drug dealer whose half-brother is kidnapped in “Alpha Dog.” That part led to a series of showy outlaws and cold-blooded killers in such films as the 2007 remake of “3:10 to Yuma,”2013’s “Lone Survivor,” 2017’s “Hell or High Water” and last year’s “Hostiles.” But opening this Friday is a tender-hearted father-daughter drama based on a true story that showcases Foster as a rare contemplative character whose actions, not words, most define him. Congrats on your recent marriage to Laura Prepon (Alex on “Orange is the New Black”) and the birth of Ella, who was on her way while you were filming “Leave No Trace.” Did she linger in your mind while you were working? My mom, who had two boys, is very pleased to have a girl. And, for sure, it was impossible to separate those ideas of saying goodbye to your daughter at work and feeling her kick. She celebrates her first year soon. Appreciate that, since kids grow up so fast. That is what every parent says and, with my very limited and new experience, it is so true. The good fortune though this year is my lady is on a show and she was working. So I took the year off. I haven’t worked since “Leave No Trace.” I’ve been this stay-at-home dad for the past year. That’s been really altering. This film moved me in a way that few have this year. And I was thinking of what moment really got to me. There is that one scene where Will is talking with a social worker and he asks if he is proud of his daughter. And your reaction when you take a deep breath and barely can answer immediately triggered my tear ducts. It was like the best thing ever. I appreciate this film because it allows you to act in a more quietly subtle yet still deeply felt way. That said, I am a big fan of “Hell or High Water.” I have a screenplay crush on Taylor Sheridan. He writes movies for adult tastes, which I appreciate. His new TV show, “Yellowstone,” is premiering tonight. I got a sneak peek of it at Taylor’s place. He is one of the very few. We met once before in 2010 at the Sarasota Film Festival, when you, Stanley Tucci and Steve Buscemi did a staged reading of Oren Moverman’s script based on William S. Burroughs’ book, Queer. On the final night, you were sitting at the hotel bar and I just wanted to tell how great you were in “The Messenger.” I was on the narrative film jury and we gave a special prize to Debra’s “Winter’s Bone.” Did you first see the film there? I saw it later, much later. I was a fan of Debra’s since her first movie, “Down to the Bone.” That film was very affective work and that is what drew me to her. I saw “Winter’s Bone” behind everyone else. Also, her documentary work. It took a while for her to do a feature again. She likes to do her homework. This film shares some elements with “Winter’s Bone.” Both are a portrait of people struggling with their lives and trying to make ends meet. And Debra has once again shown she has a knack for finding terrific female acting talent. But “Winter’s Bone” exposed the corroded underbelly of backwoods dwellers involved with making meth. 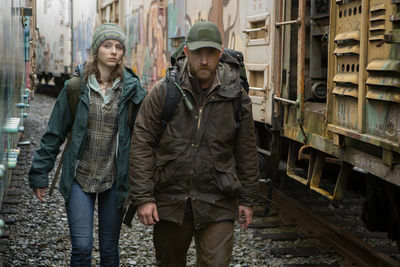 With “Leave No Trace,” I kept being suspicious of the officials who discover your encampment in the woods. But it turns out that everyone that Will and Tom meet are generous, kind, caring and sympathetic to their needs. It made me want to go off the grid. There are some qualities that are appealing. I think it will resonate with many who would like to run away from all the dissonance in our country right now. I don’t know if it struck you when you read the script because you tend to play these more difficult characters. It’s funny. I’ve heard that before. These films, I like to work and every five years there is something that has really resonated. I think of this as being on the same shelf as “The Messenger” and “Ain’t Them Bodies Saints.” It is just a different genre and it lends itself to a longer take or environmental connection. I am as uniquely drawn to that just like a Western. It’s just a different kind of music. All this empathy could feel very treacly. But the reason it doesn’t is, as much as they try to help Will, he is too broken to fully connect to the community and the responsibility that connection involves. How would you describe what is wrong with Will? Trauma. We all deal with it differently. One thing I greatly appreciate about Debra’s approach is that she trusts the audience to fill in Will and Tom’s backstory for themselves. There is a lack of exposition that is refreshing. We know Will’s wife is not with them and that he and Tom clearly love her. That is enough of a clue. Isn’t that nice? In prep for this job, I read the script, and Deb and I spoke about it. And the line—“Is it a want or a need?”—was the key for me. I brought that up to Debra. So I said, “Why don’t we do a pass of the script and start red-lining it. If he doesn’t need to say it, let’s get rid it.” She and I eliminated, I’d say, 40 percent of the words. It was already a beautiful, sparse script. But my interest in this was about getting down to its barest. Because we don’t need all the chatter. You have been directed by two other female filmmakers, Asia Argento (“The Heart is Deceitful Above All Things”) and Melanie Laurent (the upcoming “Galveston”). At least. I also worked with several women directors when I was on “Six Feet Under.” Alan Ball made sure it was very well staffed. Was it a different experience when you worked with a woman behind the camera? A director is a director is a director. If you connect with somebody energetically, that’s all that matters. If you can share a similar way of asking questions or challenges each other and inspire each other to go a bit further. That always a joy. I want—like everyone, I believe—a much more even playing field. We aren’t there. My wife is a director now. She is directing episodes of “Orange” and she is prepping her next one. So it is very much part of the culture at home. But looking at the numbers, it is obscenely imbalanced. I’m not going to be the guy to separate, “Is it different?” It’s unusual and shouldn’t be. I did a Q&A with Barry Levinson at the local Jewish Film Festival last year and he showed your first major movie, “Liberty Heights.” You were incredibly charming and funny as the rebellious son who dressed up as Hitler for Halloween and secretly dated a black girl. You did sitcoms and comedy films when you were starting out but not so much now. Nothing makes me happier than laughing. This year, I probably watched fewer movies and more episodes of “Veep” and “Barry.” I'd much rather laugh at life. Whenever I run into Judd Apatow, because I did “Freaks and Geeks” with him, I ask him, ‘Why don’t you let me play with you guys? You guys are a lot more fun.’ I’m melancholy, heartbroken, war-torn. It’s interesting that Debra used [Thomasin Harcourt McKenzie's] real name in the movie. She wanted that. 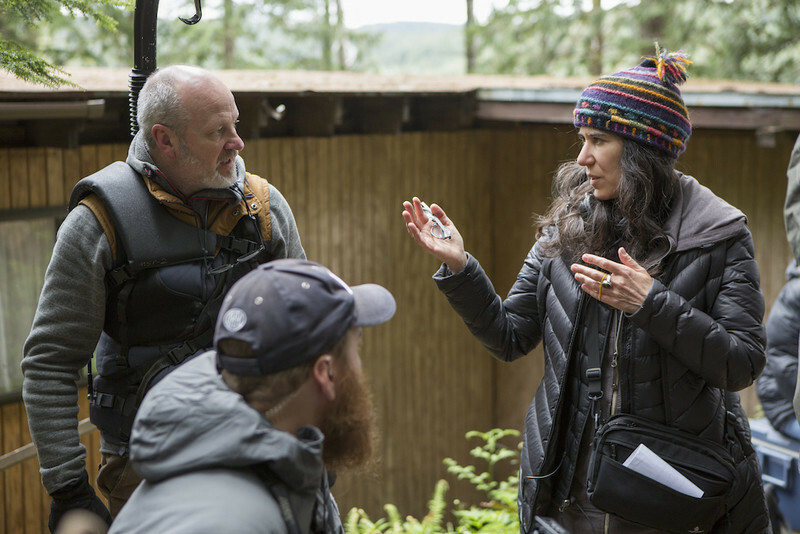 Debra just came to me a few days before we started filming and, “Tom is going to be referred to as Tom.” I said, OK.
She is wonderful in a way that is reminiscent of Jennifer Lawrence in “Winter’s Bone.” I don’t think she has topped that performance for me. There was something so real about her. This is a whole new female discovery. You two together are magic. Did she have that from the get-go? She was a miracle from the first day. Sometimes you have to work at building a relationship. With her, it was very quick. You want to take care of her and you also want to listen to her opinion. She is a very smart, very involved being. What a wonderful time working with her was. You would never know she had a New Zealand accent. Because that accent is strong. As are ours. She would do American accents and end up making fun of us. What was the moment that both of you really meshed? It was right before we had done the first scene. We had done a survival school together and I had gone a bit early and I was able to share some of that with her in order for some bonding. That can take the place of traditional rehearsal. And her mom suggested that we do an acting exercise that was based on a Maori ritual called a hongi. That is “shared breath.” It’s a hug, forehead to forehead, and her caretaker was going to watch so that it was a safe environment that was timed. And we knew it was going to be a minute long. And we were to embrace. It was brought up to me before we started shooting and I said, “That sounds fine.” And right before she said, “I would like to do this now,” and we went out to the woods. Her caretaker said, “You may begin,” and she looked at her watch. And we put our foreheads together and just hugged and we held each other. And it’s startling to hold a stranger and allow yourself to be held that long with the intention that, “I will be good to you.” Usually, in my family, we are warm and not an unphysical family. But you don’t hug for that long. And something happened. Time was up and we released each other and she was my daughter then. I also like that kind of a smooching noise you make with your mouths to each other. We were working with a wilderness guide teacher and she said you would probably have a call. We were talking about whistles but my gut said that was probably too aggressive and also it would alert the authorities. Something in my home life, with my friends or my brother, there was a noise that sounded like what you would use around a horses. We brought it to Debra, and she said fine. You are known for going the extra mile to prepare for your parts. I am guessing you got fairly proficient with survivalist skills for living in the wild. We had a two-week intensive course. You know the show “Alone” on the History channel? Alan Kay, who won season one, and Nicole Apelian, who came in fourth on season two—they were our teachers. That is how I came to learn how to build a shelter for Tom and myself. And build the camp and the fire. Just basic stuff that helped get rid of the words, which was very important to me. You learn to do whatever your character is doing so I don’t have to think about it. What do you hope that people who see “Leave No Trace” take away from the experience? Hug your family. That’s what I want. I want people to go home and hug their kids, hug their parents. If you can. It’s a really hard time right now. And if you get the opportunity, squeeze the ones you love.